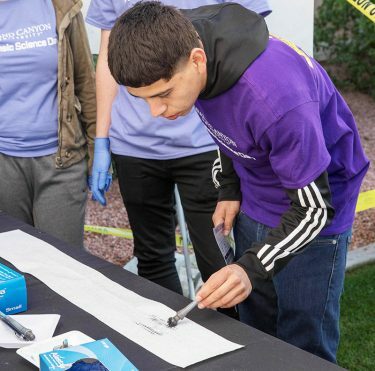 Forensic science tools include footprint identification, as a high school student learns at GCU’s annual Forensic Science Day. Allie Lott and Gabby Sequeira, both from Gilbert and both home-schooled, were all smiles Tuesday at Grand Canyon University as they milled about with nearly 1,500 other students on Forensic Science Day. And that was before they found out that their two-person team was one of the three winners in the Crime Scene Challenge, the annual contest of wits for junior sleuths attempting to crack a complex “murder” scene set up for their benefit. “We won!” Lott said with a joyous grin mirrored by her teammate. They came in second but had beaten out much bigger teams from among the 83 public and Christian high schools who participated in one of GCU’s most popular annual events. 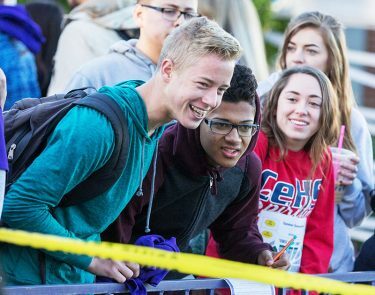 Hundreds of high school students tried to solve a crime set up behind police tape. 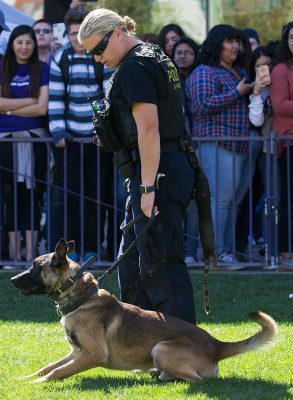 Crowds of visitors toured DNA and cadaver labs, watched a police dog demonstration and listened to an impressive roster of forensic experts, such as members of the Phoenix and Scottsdale police departments and crime laboratory investigators. Among the many topics were forensic dentistry, forensic art, forensic firearm examination and forensic biology screening. It’s a tradition for GCU’s forensic science majors to run a gauntlet of hands-on booths in such areas as tire track, footprint, blood spatter and fingerprint analysis. The exhibits drew students intrigued by the multistep process of making a positive identification that police can use as evidence. A high school visitor dusts powder over a tire print. 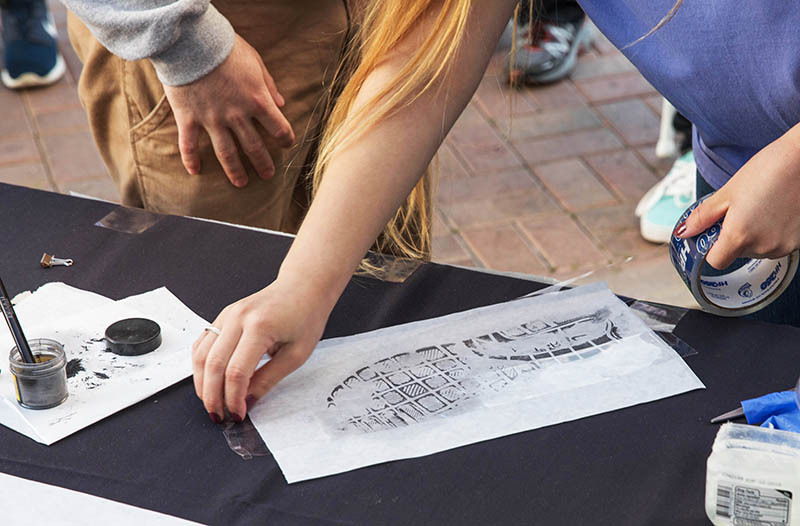 At GCU senior Matt Brown’s tire tread exhibit, students spread Vaseline onto tires, rolled the tires onto paper and shook dark gray dust on the marks to create a tire pattern. If a tire impression is left at the scene of the crime, forensic scientists can compare it to a suspect’s car. Brown said that thousands of variables go into tire tread identification, but each tire has a unique pattern because of how and where the individual car is driven, Brown said. “It takes a lot of practice,” he said. 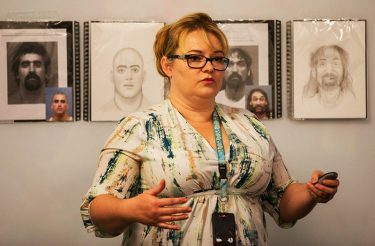 Erin Hickson, a firearms analyst and forensic artist who works in the Phoenix police crime lab, fascinated a packed classroom with composite drawings she created based on witness interviews. Hickson shows witnesses books containing pictures of various ears, eyes, noses and foreheads and asks them to pick out the closest matches. Then she draws the face based on their choices. “For my drawings, so far, I’ve got a 40 percent hit ratio,” Hickson said. Erin Hickson from the Phoenix Police crime lab displayed her remarkably accurate composite suspect drawings. She exhibited several composite sketches and the mug shots after arrests were made. Her drawings were remarkably similar. The largest crowd every year surrounds the Crime Scene Challenge. Teams of students investigate the scene, decide what evidence is important, determine what happened and write it down an contest entry sheet. This year’s scene featured a female “corpse” with a white noose around her neck, bruising around her throat and a gunshot to her head. She was seated at a table that held two glasses, one on its side and the other partly filled, a roll of tape, a bullet, a bullet casing and plenty of cash. The bills also spilled out of the corpse’s pocket and onto the ground near a gun that rested by the table. Wesley Loveall, a junior from Camp Verde High School, said it was obvious to him what happened: “It’s a murder made to look like a suicide,” he said. One of the Forensic Science Day highlights is a police dog demonstration. Brandon Ruiz, a sophomore from the same school, said the murderer “was in shock. In a struggle for the gun, he shot her and was shocked.” That’s why all the money was left. Mangiapane suggested the bullet was fired from far away because there was no powder on the corpse’s shirt, which rules out suicide. Ana Kelly, a GCU forensic science senior, whispered the solution: It was in fact a homicide made to look like a suicide. “The murderer used a gun, you can see the gunshot wound to her head and the gun on the other side, and then set it up to look like she killed herself,” Kelly said. Even before having such a successful day, Lott knew where she was going to college in the fall. She is already enrolled at GCU.